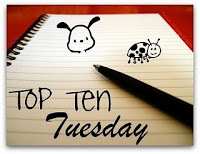 Question: Top 10 Books that have been recommended to us? Answer: It’s just like it sounds. Below are the best of the books that were recommended to us. It’s scary to think that we may have overlooked some of these gems had it not been for a few timely conversations / blog posts. We also owe a huge debt of gratitude to the geniuses at the BBC for producing a recommended reading list that has rarely let us down. Harry Potter series (J.K. Rowling) – It was actually one of our mothers who recommended this series. Thanks Mom! To Kill a Mockingbird (Harper Lee) – We would personally like to thank the other Bibliomaniac for this recommendation. This book became our first ever read-along way back in our crazy high school days. Very good, Jeeves (P.G. Wodehouse) – We’d still be completely blind to the brilliant humor of Wodehouse had it not been for the infamous 200lb Man. I Capture the Castle (Dodie Smith) –J.K. Rowling endorsed this novel during an interview many years ago. If it’s good enough for the creator of Harry Potter, it’s good enough for us. Thanks again for this one, Jo. James and the Giant Peach (Roald Dahl) – Chalk another one up for the parentals. Shutter Island (Dennis Lehane) – It was a near life changing conversation with Off the Record that inspired us to read this book. The Hobbit (J.R.R Tolkien) – You rock sixth grade English teacher. We can’t remember that actual person, but this novel was one of the choices for our yearly book report. As a result Tolkien became a staple of English class book reports for the following 3 years. The Book Thief (Markus Zusak) – Over and over, this book kept coming up as one to read. After close to a bazillion pokes and prods we finally took the plunge. It’s hard to understand why we ever waited so long. Dirk Pitt series (Clive Cussler) – We’ve got an uncle to thank for our introduction into this series. The Hunger Games (Suzanne Collins) – For this novel we owe a special thanks to the blogosphere. Thanks for the extra kick in the shorts. To Kill a Mockingbird is on my list too. But, gosh, yes, Shutter Island . . . I forgot all about that one. It was recommended to me a while ago, but I have yet to find a copy to put on my TBR shelf. Thanks for reminding me. I thought about including The Book Thief on my list as well! I heard so many good things about it I had to give in eventually. Ooooh, great list. I love the books I have read on this list, and now I'm going to have to check out the ones I haven't read. Thank you. I didn't really think about the fact that all the books my parents read to me as a child are kind of like recommendations. I will have to thank them for L'Engle and C.S. Lewis.